In one embodiment of this invention a surface silicated alumina composition, as opposed to conventional silica alumina, is provided. Such composition may also be fluorided and/or phosphated or phosphited. The resulting compositions are broadly useful but are of particular applicability as supports for chromium olefin polymerization catalysts. In another aspect alumina is fluorided and used with hexavalent chromium catalyst and a co-catalyst or in the alternative with an organochromium catalyst. If desired the support in this embodiment can also be phosphated or phosphited. In another embodiment, aluminum phosphate is formed in the pores of alumina. In contrast with alumina catalyst supports of the prior art, the supports of this invention allow for the production of olefin polymers at high rates of productivity. Also novel high density ultrahigh molecular weight polymers are produced. It is still a further object of this invention to provide catalysts having a wide sensitivity to H2 as a MW regulating agent, from almost no sensitivity to highly sensitive. The term "silicating agent" is meant to encompass silicon alkoxides and aryloxides and their hydrolysis products, e.g. alkoxysiloxanes, which upon calcining in the activation of the support or catalyst yield high purity, refractory silica. Examples of such compounds include tetramethoxysilane, tetraethoxysilane (tetraethyl orthosilicate), tetra(2-ethylbutoxy)silane, tetrakis(2-methoxyethoxy)silane, tetraphenoxysilane, and phenyltriethoxysilane and their hydrolysis products and mixtures thereof. A presently preferred silicating agent comprises a polymeric siloxane form of tetraethoxysilane containing the equivalent of 40 weight per cent silica. Such a composition is commercially sold as Silbond @ 40 by Stauffer Chemical Co., Westport, Connecticut. In accordance with another embodiment the alumina is treated with a fluoriding agent so as to incorporate fluorine onto the alumina to produce a support for a hexavalent chromium catalyst which is used with a cocatalyst or as a support for an organochromium catalyst. A preferred fluoriding agent is ammonium bifluoride, NH4HF2. Also suitable is ammonium silicofluoride, (NH4)2SiF6. While ammonium silicofluoride contains both silicon and fluorine, and while as will be discussed hereinafter, a combination of silicating and fluoriding is within the scope of the invention, ammonium silicofluoride probably does not incorporate anything except the fluorine since the silicon is lost during heating. The fluoriding agent can be combined with the alumina in any suitable manner but it is generally done by forming a slurry of the alumina in a solution of the fluoriding agent and a suitable solvent such as alcohol or water. Particularly suitable are one to three carbon atom alcohols because of their volatility and low surface tension. A suitable amount of the solution is utilized to provide the desired concentration of fluorine in the composite after drying. Drying can be effected in a conventional manner, such as suction filtration followed by evaporation or drying under vacuum. In view of the use of a relatively volatile solvent such as methanol, relatively mild conditions such as 100°C or less can be utilized. A combination of fluoriding and silicating to give F-Si/A1203 can also be utilized. In such instances, it is preferred to add the fluoriding agent first and most preferred to dry after adding the fluoriding agent before adding the silicating agent. This is because in some instances adding the fluoriding agent after the silicating agent and/or after the chromium can cause an undesirable precipitate. It is possible, however, to add the ingredients in any order. If desired, the fluorided alumina, silicated alumina or fluorided and silicated alumina can be further treated with a phosphating or phosphiting agent to give a system containing up to five components on adding chromium, i.e. P-F-Si-Cr/A1203. Thus the phosphated or phosphited support can be P-F-Si/A1203, P-F/A1203 or P-Si/Al203. Generally when a phosphating or phosphiting agent is to be used in conjunction with the fluoriding or silicating, the phosphorus treatment is carried out first. The phosphating or phosphiting agent is preferably used in an amount to react with the alumina to give a P/Al atom ratio of the reaction product on the surface of 0.01:1 to 0.3:1, preferably 0.05:1 to 0.2:1. In practice, however, it is possible to use as much phosphating or phosphiting agent as desired with the excess simply being washed off after the phosphating or phosphiting treatment is complete. The phosphating or phosphiting treatment is generally carried out on alumina which has been previously calcined in air at 300°-700°C. The phosphating or phosphiting treatment is generally carried out at a temperature of 15°C to 500°C, preferably room temperature to the boiling point of the solvent if a phosphate or phosphite solution is used or about 200°C if a vapor is used and a time of 1 minute to 2 hours, preferably 2 minutes to 30 minutes. Generally a methanolic solution of H3P04 is used. Stated in other terms, the phosphorus component is added in an amount to give 1 to 30, preferably 5 to 20 mole percent of the phosphorus compound incorporated based on the total moles of aluminum. Generally, the ratio of atoms of phosphorus per atom of chromium will be in the range of 100-3000, preferably 500 to 2000. Based on the surface area, the phosphorus compound from the phosphating agent is preferably present in an amount sufficient to give about 0.005 to 1, preferably about 0.01 to 0.5 mg P/m2 of alumina surface as measured by BET nitrogen sorption. There are two aspects to the invention as far as the type of chromium compound is concerned. In the first aspect, the chromium compound can be any compound in or convertible to the hexavalent state and can be introduced anytime prior to activation. The catalyst contains chromium in an amount generally within the range of about 0.001 to 10, preferably 0.1 to 5, more preferably about 1 weight percent based on the weight of the dried treated alumina support, or since the amount of incorporated treating agent is relatively small, 0.001 to 10, preferably 0.1 to 5, more preferably about 1 weight percent based on the alumina. The chromium compound can be incorporated as known in the art. For instance, a hydrocarbon solution of a material such as tertiary butyl chromate can be used to impregnate the xerogel or an aqueous solution of a chromium compound such as Cr03 (chromium trioxide), chromium acetate or chromium nitrate can be added to the hydrogel before drying or chromium can be coprecipitated along with the alumina. Preferably the chromium is added after any fluoride treatment and after any phosphorus treatment. In the second aspect of this invention so far as the type of chromium is concerned, an organochromium compound wherein the chromium has less than its maximum valence can be used. Of course an organochromium of the type described herein can also be used in the first aspect as the chromium source for conversion on calcination to hexavalent chromium. In this aspect, however, organochromium is introduced after high temperature activation of the support rather than before. The same temperature and ambient used for activating the catalyst in the first aspect can be utilized for activating the support in the second aspect, although greater leeway is possible with temperatures as low as 150°C and as high as 1000°C being operable for activating the support prior to the introduction of the chromium. The organochromium compounds can include zerovalent compounds such as pi bonded chromium complexes such as dicumene chromium or dibenzene chromium. These pi bonded zerovalent chromium compounds are disclosed in more detail in Delap, U.S. 3,976,632 which issued August 24, 1976, the disclosure of which is hereby incorporated by reference. Also suitable are divalent organochromium compounds such as chromocene, bis-(cyclopentadienyl)chromium (II), and substituted derivatives thereof in which the cyclopentadienyl rings contain one or more substituents. wherein n is 3 or 4; x is 3 or more; R is -CH 2MR'R"R"'; wherein M is a Group IVA element, i.e. C, Si, Ge, Sn or Pb; and wherein in a given compound the R groups are identical and R', R", and R"' are the same or different (preferably the same) hydrocarbyl groups selected from aliphatic and aromatic radicals containing up to about 10 carbon atoms per radical, preferably alkyl radicals containing up to 4 carbor atoms per radical. Also included are combination radicals such as alkaryl. The preferred compound of Formula I is the one wherein M is Si, R', R" and R'" are methyl (-CH3), and n is 4, Cr[-CH2Si(CH3)3]4, i.e. tetrakis-(trimethylsilylmethyl)chromium (IV). For Formula II, the preferred compound is the one wherein M is Si, R', R", and R"' are methyl(-CH3), and x=2; i.e. the tetramer, Cr4(-CH2Si(CH3)3]8, octakis-(p-trimethylsilylmethyl)tetrachromium(II). Examples of other suitable compounds of Formula (II) include octakis(benzyldimethyl-silylmethyl) tetrachromium and octakis(allyldi- formation of the phosphate serving to treat and thus "activate" the normally inactive alumina. While any agent which neutralizes acid can be used, a base such as concentrated ammonium hydroxide, ammonia gas, or ammonia dissolved in alcohol or other nonaqueous solvents is preferred. Also ammonium carbonate, ethylene oxide and propylene oxide can be used. The neutralization agent is added in an amount to give gelation essentially instantaneously down to a lesser amount wherein gelation will occur on standing for up to 1 hour. The final pore cogel can be finished by washing with water and/or alcohol or such washing can be omitted. When this pore cogel is used as a support for a catalyst component such as a chromium compound it provides an intimately formed two component catalyst as contrasted with a mixture or a unitary composition. The hexavalent Cr catalysts of this invention are generally used in conjunction with a cocatalyst. Suitable cocatalysts include organoaluminum and organoboron compounds. The most preferred boron compounds are trihydrocarbyl boron compounds, particularly tri-n-butylborane, tripropylborane, and triethylborane (TEB). Other suitable boron compounds include trialkyl boron compounds broadly, particularly those having alkyl groups of 1 to 12 carbon atoms, preferably 2 to 5 carbon atoms, triaryl boron compounds such as triphenylborane, alkyl boron alkoxides such as B(C2Hs)20C2Hs and halogenated alkyl boron compounds such as BCZH5C12. Suitable aluminum alkyls include R3 4Al, RlAlX and R4AlX2 compounds where R4 is a 1 to 12 carbon atom hydrocarbyl radical and X is a halogen, preferably chlorine. Triethylaluminum and diethylaluminum chloride are particularly suitable. The polymers can be prepared from the catalyst of this invention by solution polymerization, slurry polymerization, and gas phase polymerization techniques using conventional equipment and contacting processes. Contacting of the monomer or monomers with the catalyst can be effected by any manner known in the art of solid catalysts. One convenient method is to suspend the catalyst in the organic medium and to agitate the mixture to maintain the catalyst in suspension throughout the polymerization process. Other known contacting methods such as fluidized bed, gravitating bed, and fixed bed can also be employed. The catalyst of this invention can be used to produce ethylene polymers in a particle form process as disclosed in U.S. 3,624,063 which issued November 30, 1971 to Witt, the disclosure of which is hereby incorporated by reference. The catalyst of this invention is particularly suitable for use in slurry polymerizations. The slurry process is generally carried out in an inert diluent (medium) such as a paraffin, cycloparaffin or aromatic hydrocarbon. For predominantly ethylene polymers, a temperature of about 66-110°C is employed. Pressures in the particle form process can vary from about 110 to about 700 psia (0.76-4.8 MPa) or higher. The catalyst is kept in suspension and is contacted with the monomer or monomers at sufficient pressure to maintain the medium and at least a portion of the monomer or monomers in the liquid phase. The medium and temperature are thus selected such that the polymer is produced as solid particles and is recovered in that form. Generally in slurry polymerization of ethylene homopolymer or predominantly ethylene copolymer systems, the feasible temperature range is 150-230°F (66-110-C). When hydrogen is used in the prior art, it is generally used at pressures up to 120 psia (0.8 MPa), preferably within the range of 20 to 70 psia (0.01 to 0.48 MPa). Similar amounts can be used in accordance with this invention although smaller amounts are sometimes preferred with the organochromium because of the sensitivity of this catalyst system to the effects of hydrogen. Stated in terms of mole percent hydrogen based on moles of diluent the hydrogen concentration can be from about 0.1 to 10, preferably about 0.2 to 1.25 mole percent, most preferably about 1 mole percent. Supports employed in the Examples include for the control runs Davison 952 silica and AlP04 made according to U.S. 4,364,841. For the invention runs Davison HPV (high pore volume) A1203 and Ketjen B A1203 were used. A series of supports was made from a commercially available, particulate grade alumina, from Davison described as high pore volume (HPV) alumina having a surface area of about 530 m2/g and a pore volume of about 2.7 cc/g (B.E.T.) After treatment each portion of alumina used was calcined for 3 hours in dry air at 600°C. Control catalyst A consisted of the calcined, unmodified alumina used in conjunction with 0.1 mmole of tetrakis-(µ-trimethylsilylmethyl)tetrachromium(II), abbreviated Cr4(TMS)3, per gram of support. The Cr4(TMS)3, a novel compound was made as disclosed in Example 13. Invention catalyst B consisted of a silicated alumina and the same level of Cr4(TMS)$ as in catalyst A. The alumina was silicated using a methanolic solution of Silbond 40® to give 3.2 weight percent Si02 as described hereinbelow with catalyst D.
Invention catalyst C consisted of a fluorided alumina and the same level of Cr4(TMS)8 per gram support as for catalyst A. The fluorided support was prepared by impregnating the alumina with a sufficient amount of NH4HF2 in excess methanol to provide 1.5 weight percent combined fluorine, calculated as F, in the dry composite. Following impregnation, the mixture was dried in a vacuum oven at 80°C for 12 hours. The product was sieved through a 35 mesh screen and a portion was calcined at 600°C as before to obtain the modified support. Invention catalyst D consisted of a fluorided, silicated alumina used in conjunction with Cr4(TMS)8 at the same level as for catalysts A and B. The modified support was prepared by admixing the alumina with a methanolic solution of NH4HF2 and with Silbond 40@ sufficient to provide 1.5 weight percent F and 3.2 weight percent Si02 based on the dry composite. After drying as before the product was sieved and calcined in the manner described above. 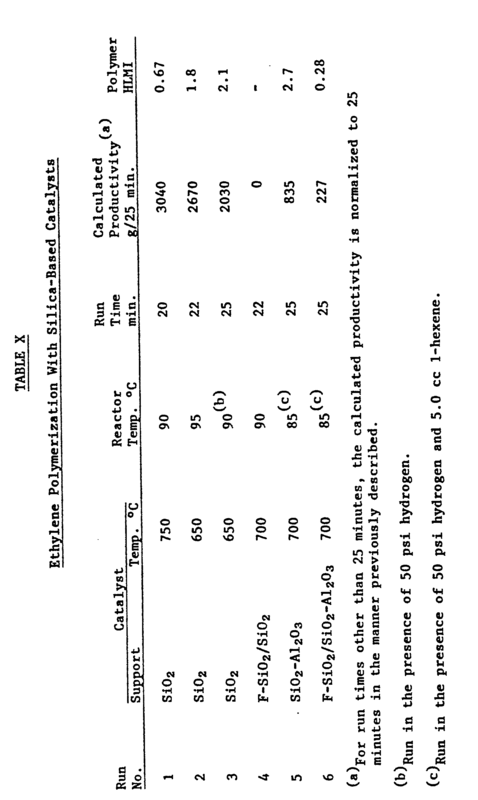 Ethylene was polymerized in a 2 liter stirred stainless steel reactor at 95°C using a 30 mg portion of each support and the proper amount of Cr4(TMS)3 as noted earlier. The Cr4(TMS)g was injected separately into the reactor already charged with the support. The reactor contained 1.25 lbs. (567 g) of isobutane as diluent. Each run was conducted for 1 hour for catalysts A and B and 30 minutes each for catalysts C and D at a total reactor pressure (diluent plus ethylene) of about 565 psia. This pressure was maintained by supplying ethylene as needed from a pressurized reservoir. It was found that control catalyst A produced polyethylene at a calculated rate of 270 g polymer per g support per hour. Polymer properties were not determined. Invention catalyst B produced polymer at a rate 800 g/g/hr. Invention catalyst C, in contrast, produced polyethylene at a calculated rate of 12,000 g polymer per g support per hour. The polymer had a high load melt index (HLMI) of 1.4 g/10 minutes as determined in accordance with ASTM D 1238, condition F.
Invention catalyst D, produced polyethylene at a calculated rate of 13,500 g polymer per g support per hour, having a HLMI of 0.4 g/10 minutes. It is clearly the modifying of the alumina by the fluorine and fluorine plus silica that is responsible for the pronounced increase in catalyst activity although just the silicating treatment results in some improvement. The results are summarized in Table I. A pair of catalysts was made by impregnating the specified dry, calcined support with a solution of bis(cyclopentadienyl)chromium (II) dissolved in a paraffin, e.g. n-heptane, sufficient to add 2 weight percent chromium, based on the dry composite. The supports employed included high pore volume alumina and the same alumina impregnated with 3.0 weight percent Si02 and 1.5 weight percent F, both dried and calcined for 3 hours at 700°C in dry air. A portion of each catalyst was employed in ethylene polymerization as before. The results are presented in Table II. The low productivity results in Table II, run 1 show that bis(cyclopentadienyl)chromium on unmodified alumina, control run 1, gives a relatively inactive catalyst. Invention catalyst run 2 is much more active, and ultrahigh molecular weight polyethylene was made. A series of catalysts containing high pore volume alumina with a surface coating of Si02 was prepared by impregnating the A1203 in methanol with sufficient Silbond 40@ organosilicate solution and with sufficient hydrated chromium salt (Cr(N03)3.9H20 or Cr(C2H3O2)3·H2O) to provide compositions each containing 2.0 weight percent hexavalent Cr (as the oxide) and with varying amounts of Si02, all calculated amounts based on the vacuum dried and calcined products. Each composition was activated by calcining in dry air for 3 hours at 700°C. Ethylene polymerization was carried out in the manner previously described in the presence of 1.0 cc triethylborane (TEB), 0.5 weight percent in n-hexane, equivalent to about 8 ppm TEB, based on the weight of isobutane diluent, as cocatalyst and a weighed amount of the activated catalyst. In this series, catalyst weights ranged from about 0.05 to about 0.15 g.
The conditions used and results obtained are given in Table III. The control catalyst in run 8 of Table III produced about 250 g per 30 minutes, a typical result obtained with hexavalent Cr on unmodified alumina. Inspection of the data in invention runs 1-7 of Table III show that active catalysts were made in each instance. Catalysts containing about 8 weight percent silica, runs 4, 5, were the most active. In comparing productivity results in runs 3 and 7, each catalyst containing about 5.4 weight percent silica, it is apparent that precalcining the alumina before admixing the silica (run 7) gives a more active catalyst, e.g. productivity is about double that in run 3, than adding the silica to alumina containing volatiles (wet). Melt viscosity data are obtained by means of a Rheometrics Dynamic Spectrometer at 230°C using parallel plate geometry. Strain amplitude is 5 percent, nitrogen is used in the sample chamber and the oscillatory frequency is varied from 0.1 to 500 radians/second. The data obtained give storage modulus and loss modulus as a function of oscillatory frequency. 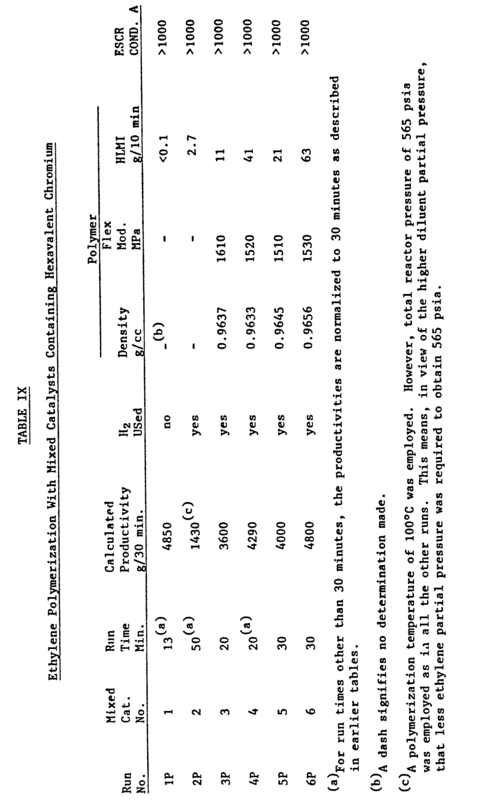 From these data in turn can be calculated dynamic complex viscosity /n */ as described in Chapter 1 of the "Viscoelastic Properties of Polymers", by Ferry, published in 1961 by Wiley. The values obtained are directly related to polymer molecular weight, with the higher the value the higher the molecular weight. It has been shown for a commercially available ultra high molecular weight polyethylene (UHMWPE) that /η*/ when determined at 0.1 radian/second and 190°C has a value of about 30 MPoise. The polymer produced in invention run 1 can be classed as UHMWPE since it has a melt viscosity of 38 MPoise. A series of catalysts containing combined fluorine and high pore volume alumina was prepared by impregnating the alumina with a methanolic solution of Cr(N03)3·9H20 sufficient to provide a calculated 1.5 weight percent Cr based on the dry catalyst, drying the mixture and impregnating same with a methanolic solution of NH4HF2 sufficient to give the specified amount of combined fluorine as weight percent based on the dry catalyst. Each catalyst was activated for polymerization by calcining in dry air at the specified time and temperature. Control run 8, Table III, is repeated as a control in this example. Ethylene was polymerized with portions of each catalyst and with 8 ppm TEB as cocatalyst in the same manner as in Example 3 at 85°C. The conditions used and results obtained are set forth in Table IV. The results for invention runs 1-4, of Table IV all show that fluoriding alumina gives more active catalysts based on productivity results compared to the results obtained in the control run 8. That is, productivity is increased from about 3.8 to 8.7-fold by the fluoriding treatment, with the catalyst containing about 2.7 weight percent combined fluorine being the most active. Ultra high molecular weight polymer, having a melt viscosity of 40 to 50 was obtained. Run 1 further shows that very small amounts of F are effective. Run 5 shows that above 3 weight percent F there is a dramatic deterioration in catalyst activity. Depending on other factors such as surface area, it is believed that 5 percent is the most that would possibly be beneficial, with 3 percent generally being the upper limit. A series of catalysts containing combined fluorine, silica and high pore volume alumina was prepared by impregnating the alumina with Silbond 40® as the silica source (NH4)2SiF6 or NH4HF2 as the fluoride source and Cr(C2H302)3'H20 or Cr(NO3)3·9H2O as the Cr source in the manner described before. Each mixture was then dried and activated (calcined) for polymerization by heating in dry air for the specified time. Ethylene was polymerized, as before, with portions of each catalyst and with 8.3 ppm TEB or TEA (triethylaluminum, one instance) as cocatalyst, and in one run, in the presence of 5 cc of 1-hexene and hydrogen. 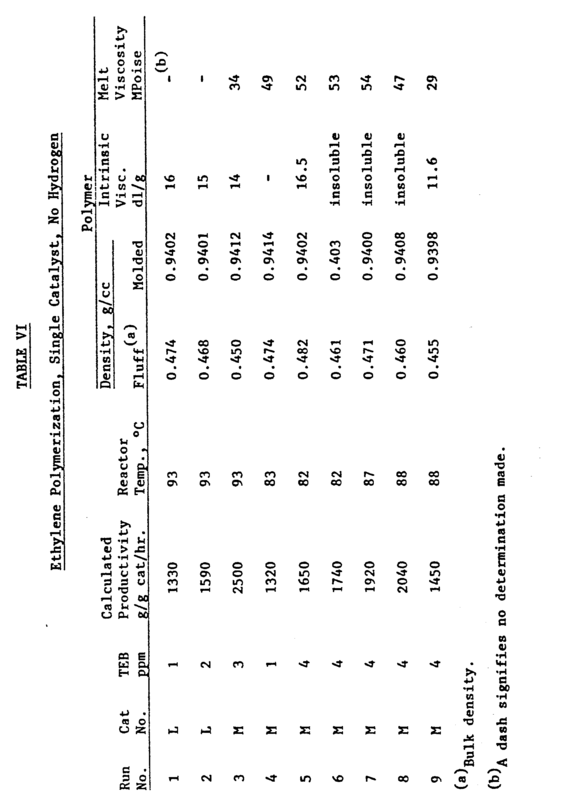 The conditions used and results obtained are presented in Table V.
Inspection of the results set forth in Table IV shows that the invention catalysts in runs 2-11 are active in polymerizing ethylene to very high molecular weight homopolymers in the absence of hydrogen based on the zero HLMI results. The melt viscosity values of 43, 54, 55 and 39 megapoise shown in runs 2, 3, 6, and 7 are considered to be indicative of ultrahigh molecular weight polyethylene. The catalyst is also rather insensitive to hydrogen as shown in run 4 since the HLMI of the ethylene/1-hexene copolymer made is 0.8. This value is indicative of a high molecular weight polymer. The low productivity of 120 g polymer per g catalyst per 30 minutes is believed to be an anomalous result. The catalyst was apparently deactivated, perhaps inadvertently contacting a poison during its production or in the polymerization process. Several silicated, fluorided high pore volume alumina-hexavalent Cr catalysts were prepared in the manner outlined before. In one instance, the alumina was treated with Silbond 40 @ and Cr(N03)3.9H20 in the presence of isopropanol and the mixture dried overnight in a vacuum oven at 80°C. The next day the solid product was mixed with NH4HF2 and methanol and that product dried in a vacuum oven as before. The dry product was activated (calcined) in dry air for 3 hours at 700°C to give invention catalyst L.
Each catalyst, on a dry basis (calcined) was calculated to contain about 4 weight percent silica, about 2.1 weight percent each of chromium and fluorine, the balance being alumina. A portion of each catalyst was mixed with another conventional catalyst consisting of 1 weight percent hexavalent chromium on aluminum phosphate, P/Al atom ratio of 0.9, the catalyst being activated for 3 hours at 700°C in dry air. This catalyst is called 0, for convenience. The catalyst systems, reaction conditions and results obtained are set forth in Table VI and VIA. The results presented in Table VI show in runs 1-3, at a constant reactor temperature that productivity increases with increasing TEB level, bulk density decreases, molded density remains about the same and polymer molecular weight is decreasing based on intrinsic viscosity data. Although, the intrinsic viscosity results are less than 20, except for runs 6-8 where the polymer was too high molecular weight to dissolve, the melt viscosity results suggest that UHMWPE is made in all the runs, thus all are considered to be invention runs. At a constant TEB level of 4 ppm the results in runs 5-8 indicate that as reactor temperatures increase, productivity also increases and polymer bulk density decreases although little change in molded density is seen. The productivity results obtained are sufficiently high to be of commercial interest. 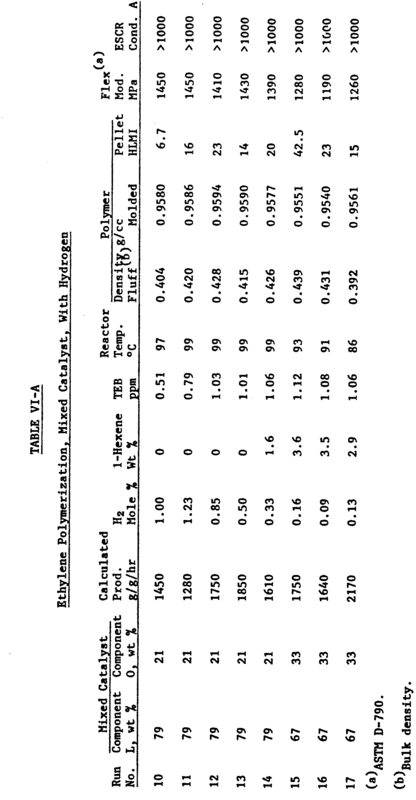 Table VIA shows the results of ethylene homopolymers and ethylene/1-hexene copolymers prepared with catalyst mixtures containing the invention catalysts. These bimodal homopolymers prepared in runs 10-13 have a higher density than those listed in Table V, reflecting the influence of the AIP04-containing catalyst. As TEB level increases in these runs, productivity also increases as before. All polymers show pellet (pelletized fluff) HLMI values ranging from about 7 to 43, and outstanding ESCR for the high stiffness, indicating that good film could be produced from at least some of them, e.g. those having a HLMI of about 20 or less. As expected, with decreasing density, the flexural moduli of the polymer samples also decrease. A series of catalysts was prepared by impregnating high pore volume alumina slurried in methanol with a methanolic solution of 85% H3P04 sufficient to provide the desired calculated quantity of phosphorus. Additionally, in the invention catalysts sufficient NH4HF2 dissolved in methanol, sufficient Silbond 40, and sufficient Cr(NO3)3·9H2O were also added to provide the desired calculated amounts of combined fluorine, Si02 and chromium, all based on the dry composites. Each mixture was dried in a vacuum oven at 80°C and activated in (calcined) dry air at 700°C, unless specified otherwise, for 3 hours. A portion of each activated catalyst was then tested in ethylehe polymerization with 8 ppm TEB as cocatalyst as described in Example 2. 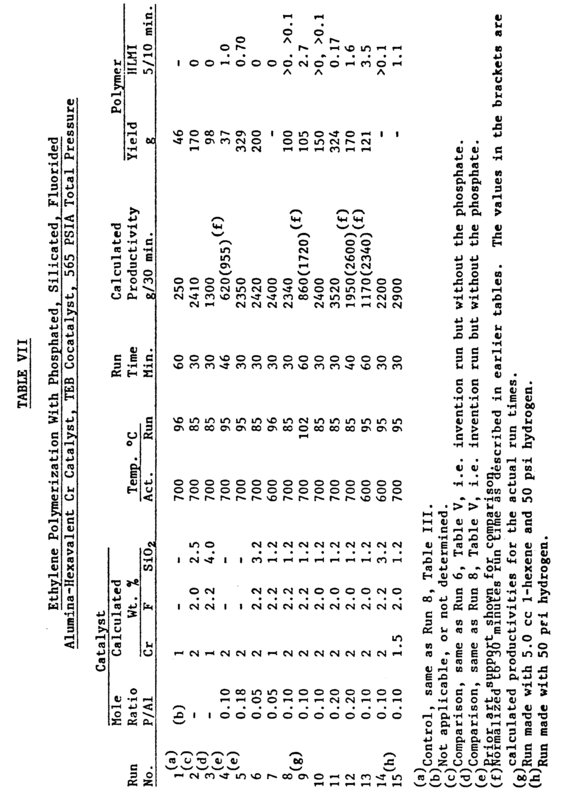 The conditions used and the results obtained are set forth in Table VII. Inspection of the results given in Table VII reveal that the alumina-supported hexavalent Cr catalysts can be fine-tuned to produce polymer in the desired high load melt index range, ranging from zero (UHMW) to about 4, or higher, by treating the support with one or more of the chemical agents described before. Without any chemical treatment, Cr on alumina is seen in control run 1 to be a low activity ethylene polymerization catalyst. Comparison runs 2, 3 show that Cr+6 on a fluorided, silicated alumina give active catalysts capable of producing UHMWPE, e.g. HLMI is zero. Comparison runs 4, 5 show that Cr+6 on phosphated alumina yield active catalysts that are capable of producing lower molecular weight polymer, e.g. HLMI of about 1, than the UHMWPE of runs 2, 3. The remaining invention runs 6-15 show, when hydrogen is absent, that Cr+6 on a phosphated, fluorided, silicated alumina give catalysts that can be more active than the comparison catalysts, e.g. invention run 11, having a productivity of about 3500 g polymer per g catalyst per 30 minutes, and the polymers have HLMI values generally intermediate those of polymers made with the fluorided, silicated aluminas, e.g. zero HLMI and polymers made with just phosphated alumina, e.g. HLMI of about 1. When hydrogen is employed in the reactor as a molecular weight modifier, lower HLMI polymers are made, e.g. invention runs 9, 12, 15, which have values ranging from about 1.5 to 3.5. Thus while the prior art run 5 is as good or better than some of the "comparison" invention runs so far as productivity is concerned, the inventive phosphated catalysts gives further flexibility in molecular weight control and overall best results as shown by run 11. A series of catalysts was prepared by contacting the previously described high pore volume alumina, modified (as described in the previous examples) by the addition of ammonium bifluoride, silica, and orthophosphoric acid (when employed) with a conventionally prepared AlP04 syrup. The contacting can be done by gelling the AlP04 in the pores of the modified alumina. For example, a concentrated solution containing the desired amounts of Al(NO3)3·9H2O, NH4H2P04 and Cr(NO3)3-9H2O dissolved in water was prepared. It was then added with mixing to the modified alumina and adsorbed into its pores leaving a seemingly dry powder. The amount of syrup must be equal to or less than the pore volume of the modified alumina. Ammonium hydroxide was then added, causing the syrup to set up into a gel within the pores of the alumina base catalyst. The syrup can also be gelled by adding ammonium carbonate solution to form AlP04 gel. The resultant composite (or pore cogel) be washed with water, then alcohol and isolated by filtration. The product is then dried in a vacuum oven and activated for polymerization by calcining in dry air at elevated temperature. In an alternate procedure, the modified alumina can be sprayed with the syrup containing the AlP04 gel. In all instances, the mixed catalysts, after isolation and drying, were calcined for 3 hours in dry air at 700°C, cooled, and stored in a nitrogen atmosphere as before. 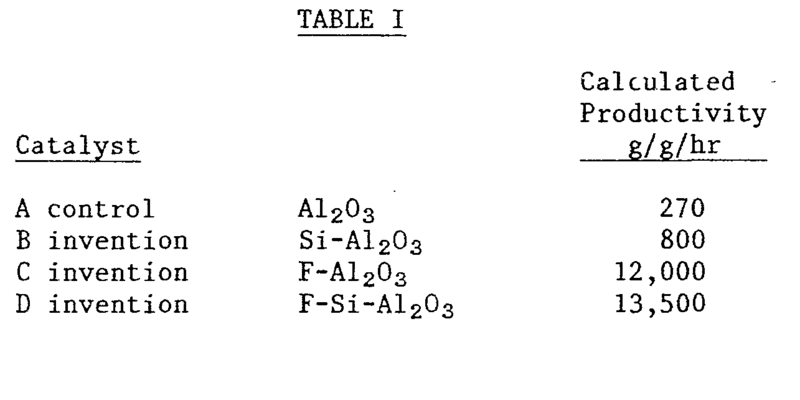 A description of the modified alumina, the calcining temperature employed after the modification, the calculated atom ratios of A1:P in the AlP04 employed, the calculated weight ratios (dry basis) of modified alumina base to AlP04 base, and the calculated total chromium (dry basis) of the mixed catalyst systems are set forth in Table VIII. Ethylene was polymerized with a portion of each catalyst in the manner employed in Example 4 at 96°C, 8:3 ppm TEB as cocatalyst and 50 psi hydrogen as adjuvant, unless specified otherwise. The results are presented in Table IX. With these dual function "pore cogel" catalyst composites one obtains an intimate bimodal mixture of high and low MW polymer without expensive blending of polymers later. Such polymers are valuable in film and blow molding applications. The results obtained in Table IX show that high density homopolymers can be prepared with the mixed or "pore cogel" catalysts, over a relatively wide range of molecular weight as evidenced by HLMI. As the amount of AlP04-based catalyst decreases the density of the polymers increases in this series. The depressing effect of hydrogen on productivity can be seen by comparing the high productivity results obtained in run 1 with the lower results obtained in run 2. In the presence of hydrogen, lower molecular weight polymers are obtained as can be noted in runs 2P-6P where HLMI values are obtained ranging from about 3 to 63 whereas in run 1P a value less than 0.1 is shown. All samples had an excellent combination of ESCR and stiffness. To illustrate the difference in the nature of ethylene polymers made with catalysts comprising hexavalent chromium on treated alumina and hexavalent chromium on similarly-treated silica and silica-alumina a series of catalysts was made with the silica supports. The silica employed was Davison 952 grade having a surface area of about 300 m2/g and a pore volume of about 1.6 cc/g. The silica-alumina was Davison grade MS 13-11D consisting of 87 weight percent silica and 13 weight percent A1203. It has a surface area of about 300 m2/g and a pore volume of about 1.1 cc/g. Each support was impregnated with sufficient aqueous solution of Cr(N03)3 to provide a calculated 1 weight chromium as chromium oxide based on the finished, activated composite. In addition, each silica support like previous alumina supports, was treated with sufficient NH4F2, Silbond @ 40 and Cr(N03)3 in the manner previously described to provide finished, activated composites, each containing a calculated 1 weight percent chromium as chromium oxide, 2 weight percent F and 3.7 weight percent added Si02. Each catalyst was employed in ethylene polymerization in a batch reactor at a total reactor pressure of 656 psia and in the presence of 8 ppm TEB in the manner previously described. The catalyst activating temperatures used and the results obtained are set forth in Table X. The results in runs 1-3, 5, 6 show that a measurable polymer HLMI was obtained in the presence of the silica-based catalysts unlike the UHMWPE made with similarly treated alumina-based catalysts. In addition, the fluoriding, silicating treatment given the silica-based catalysts resulted in decreased catalytic behavior unlike the behavior shown in Table V with the fluorided, silicated treatment of the alumina-based catalysts. A fluorided and silicated alumina was impregnated with dicumene chromium (0 valent) and chromocene (divalent). Polymerization was with hydrogen to control molecular weight. The following results were obtained. Runs 7 and 8 show the invention treated alumina with mixed 0 valent and divalent chromium gives ultra high molecular weight polymer with unusually high density. Runs 5 and 6 show the invention alumina with mixed 0 valent and divalent chromium (and H2 to give lower molecular weight) gives very high density and stiffness, better than that obtained with an AlP04 base, i.e. better than runs 3 and 4. The following data is presented to illustrate what is believed to be an unusual characteristic of polymers made with the Cr(6+)/F-A1203 catalyst system. As disclosed in the body of this application, this catalyst produces ultrahigh molecular weight polyethylene, UHMWPE. Generally speaking, density is found to decrease with molecular weight in this type of polymer in the prior art. The hexavalent chromium system mentioned above is unusual in that the UHMWPE polymer produced has the highest density yet observed for polymers of similar molecular weight. Molecular weight is usually correlated to the viscosity of a standardized decalin solution of the polymer according to ASTM procedures D-4020-81, D-2857-70 and D-1601-78. Another, less conventional measure of molecular weight is obtained from the melt viscosity of the polymer using a Rheometrics Dynamic Spectrometer operating at 230°C and .1 radians per second oscillation frequency. The data in Figures 1 and 2 illustrate the above mentioned relationships. For both measures of molecular weight, namely melt and intrinsic viscosity, the Cr(6+)/F-A1203 catalyst is shown to produce polymer with higher densities than any of the numerous control catalysts within a similar range of molecular weights. Specifically novel polymers are provided having a melt viscosity (M Poise) of 35 or greater, more specifically about 40-60 or in some instances 50 or greater and a density of 0.940 g/cc or greater, more specifically about 0.940 to 0.950, preferably greater than 0.945 g/cc. Based on intrinsic viscosity, novel polymers are provided having an intrinsic viscosity of greater than 13 g/dL, more specifically 13 to 17 or in some instances 15 to 20 at a density of greater than 0.940, more specifically at a density of 0.940 to 0.950, more preferably at a density at greater than 0.941 g/cc. Chromium(II) chloride and the grignard reagent, trimethylsilylmethylmagnesium chloride, were purchased from Alfa Chemical Company. All solvents used were reagent grade and were distilled from the appropriate drying agent (usually calcium hydride) and stored under argon prior to use. Unless indicated otherwise, all manipulations were carried out in an inert atmosphere of either argon or nitrogen. Five grams of CrC12 (40.7 mmol) were suspended in 100 ml of THF under argon. The suspension was cooled to -30°C and stirred while a solution of 50 ml of the grignard solution CIMgCH2Si(CH3)3 (1.6m in ether) diluted with 50 ml of THF was slowly added. After complete addition, the reaction solution was allowed to warm to room temperature and was stirred for another hour at that temperature. The volatiles were then removed under vacuum and the residue extracted with three 100 ml portions of pentane. The combined extracts were filtered through glass wool and the total volume of the solution reduced to 50 ml. After 24 hours at 78°C, brownish-black micro-crystals were separated from the mother liquor and washed once with cold (-78°C) pentane and dried at -78°C under. vacuum (10-4 torr) for 20 hours. Yield: 5.18 g (5.73 mmol, 56%) of the product, Cr4(TMS)g. An additional 1.20 g of product were recovered from the mother liquor by evaporating to dryness. Total yield: 6.38 g (7.05 mmol, 69%). Analysis: for Cr4(TMS)g, C32HggSigCr4, M.W. = 905.728. The same fluorided, silicated alumina base of catalyst D of Example 1 was calcined and impregnated with a solution of tetrakis(trimethylsilylmethyl)chromium(IV) to give a 1 weight percent chromium level. Polymerization runs at 95°C and 550 psig reactor pressure revealed very high productivity. While this invention has been described in detail for the purpose of illustration it is not to be construed as limited thereby but is intended to cover all changes and modifications within the spirit and scope thereof. The following part of the description are preferred embodiments 1 to 117 presented in the format of claims. 1. A method of producing a surface silicated alumina composition comprising contacting said alumina with a silicating agent in solution or in vaporous form and thereafter converting said silicating agent to silica on the surface of said alumina. 2. A method according to claim 1 wherein said silicating agent is a polymeric siloxane and said polymeric siloxane after said treating is converted to silica on the surface of said alumina by calcining in air at a temperature within the range of 500°C to 800°C. 3. A method according to claim 2 wherein said silicating agent is used in an amount sufficient to give 0.5 to 10 weight percent silica based on the weight of the alumina. 4. A method according to claim 2 wherein said contacting with said silicating agent is carried out in a slurry of said alumina in said solution of said silicating agent in a 1 to 6 carbon atom alcohol. 5. A method according to claim 1 comprising in addition subjecting said alumina to treatment with a fluoriding agent. 6. A method according to claim 5 wherein said fluoriding agent is ammonium bifluoride. 7. A method according to claim 6 wherein said ammonium bifluoride is provided in an amount sufficient to give 0.5 to 5 weight percent fluorine on said alumina based on the weight of said alumina. 8. A method according to claim 6 wherein said contacting with said silicating agent is carried out in a slurry of said alumina in said solution of said silicating agent after which the composition is dried and thereafter said fluoriding agent is added by forming a slurry of the thus dried composition in a solution of said fluoriding agent. 9. A method according to claim 5 comprising in addition subjecting said alumina to a phosphating or phosphiting treatment. 10. A method according to claim 9 wherein said alumina is calcined in air at 300°C-700°C and thereafter contacted with a methanol solution of phosphoric acid prior to contact with said silicating agent. 11. A method according to claim 10 comprising in addition introducing a chromium component onto said alumina to form a catalyst. 12. A method according to claim 11 comprising in addition subjecting the resulting composition to activation in an oxidizing ambient at 500°C-800°C so as to convert at least a portion of the chromium of said chromium component to the hexavalent state. 13. A method according to claim 12 comprising in addition combining said catalyst with a cocatalyst. 14. 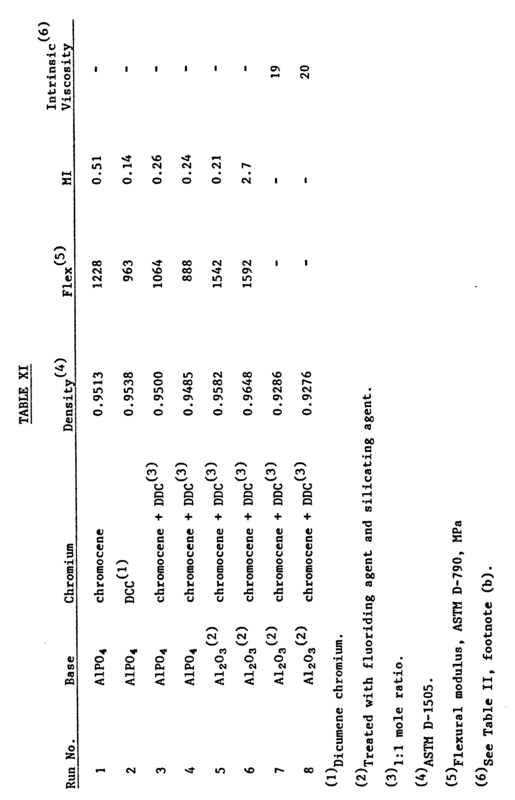 A method according to claim 13 wherein said chromium component is selected from the group consisting of chromium trioxide, chromium acetate and chromium nitrate and wherein said chromium component is included in an amount sufficient to give 0.1 to 5 weight percent chromium based on the weight of alumina and wherein said oxidizing ambient is air. 15. A method according to claim 13 wherein said cocatalyst is selected from organoboron compounds and organoaluminum compounds. 16. A method according to claim 13 wherein said cocatalyst is triethylborane. 17. A method according to claim 11 wherein said chromium component is an organochromium compound and wherein said alumina is activated at a temperature within the range of 150°C to 1000°C prior to introducing said chromium component. wherein n is 3 or 4; x is 3 or more; R is -CH2MR'R"R"'; wherein M is C, Si, Ge, Sn or Pb; and wherein in a given compound the R groups are identical and R', R", and R"' are the same or different hydrocarbyl groups selected from aliphatic and aromatic radicals containing up to about 10 carbon atoms per radical; bis(cyclopentadienyl)chromium and substituted derivatives thereof; and pi bonded zerovalent organochromium compounds. 20. A method according to claim 19 wherein said chromium compound is tetrakis-(trimethylsilylmethyl)chromium(IV). 21. A method according toclaim 19 wherein a mixture of at least two of said organochromium compounds is used. 22. A method according to claim 5 comprising in addition introducing a chromium component with said alumina so as to produce a catalyst. 23. A method according to claim 22 comprising in addition subjecting the resulting composition to activation in an oxidizing ambient at 500°C-800°C so as to convert at least a portion of the chromium of said chromium component to the hexavalent state. 24. A method according to claim 23 comprising in addition combining said catalyst with a cocatalyst. 25. A method according to claim 24 wherein said chromium component is selected from the group consisting of chromium trioxide, chromium acetate and chromium nitrate and wherein said chromium component is included in an amount sufficient to give 0.1 to 5 weight percent chromium based on the weight of alumina and wherein said oxidizing ambient is air. 26. A method according to claim 25 comprising in addition combining said catalyst with a cocatalyst. 27. A method according to claim 26 wherein said cocatalyst is selected from organoboron compounds and organoaluminum compounds. 28. A method according to claim 27 wherein said cocatalyst is triethylborane. 29. A method according to claim 22 wherein said support is activated at a temperature within the range of 150°C-1,000°C prior to said addition of said chromium component and wherein said chromium component is an organochromium compound. bis(cyclopentadienyl)chromium and substituted derivatives thereof; and pi bonded zerovalent organochromium compounds. 32. A method according to claim 31 wherein said chromium compound is octakis-(p-trimethylsilylmethyl)tetrachromium(II). 33. A method according to claim 31 wherein a mixture of at least two of said organochromium compounds is used. 34. A method according to claim 1 comprising in addition subjecting said alumina to a phosphating or phosphiting treatment. 35. A method according to claim 34 wherein said alumina is calcined in air at 300°C-700°C and thereafter contacted with a methanol solution of phosphoric acid prior to contact with said silicating agent. 36. A method according to claim 34 comprising in addition introducing a chromium component onto said alumina to form a catalyst. 37. A method according to claim 36 comprising in addition combining said catalyst with a cocatalyst. 38. A method according to claim 36 comprising in addition subjecting the resulting composition to activation in an oxidizing ambient at 500°C-800°C so as to convert at least a portion of the chromium of said chromium component to the hexavalent state. 39. 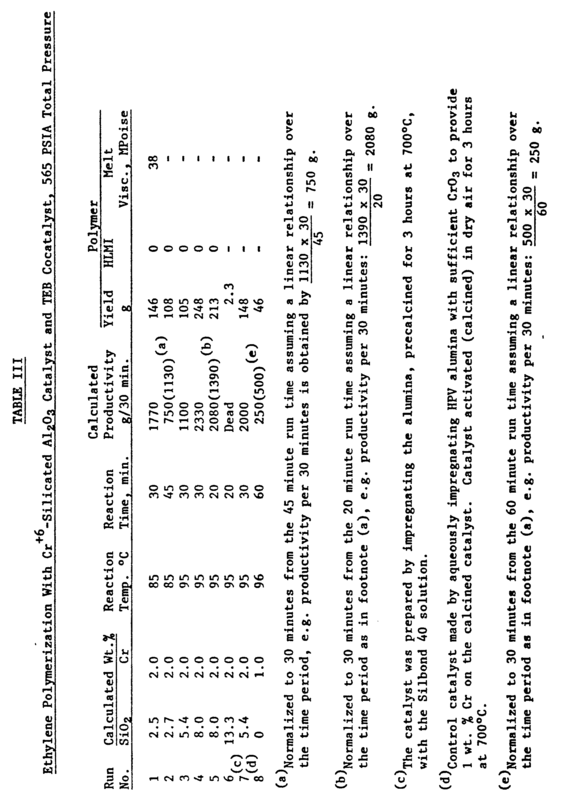 A method according to claim 38 wherein said chromium component is selected from the group consisting of chromium trioxide, chromium acetate and chromium nitrate and wherein said chromium component is included in an amount sufficient to give 0.1 to 5 weight percent chromium based on the weight of alumina and wherein said oxidizing ambient is air. 40. A method according to claim 39 comprising in addition combining said catalyst with a cocatalyst. 41. A method according to claim 40 wherein said cocatalyst is selected from organoboron compounds and organoaluminum compounds. 42. A method according to claim 41 wherein said cocatalyst is triethylborane. 43. A method according to claim 36 wherein said support is activated at a temperature within the range of 140°C-1,000°C prior to said introducing said chromium component and wherein said chromium component is an organochromium compound. wherein n is 3 or 4; x is 3 or more; R is -CH2MRR"R"'; wherein M is C, Si, Ge, Sn or Pb; and wherein in a given compound the R groups are identical and R', R", and R"' are the same or different hydrocarbyl groups selected from aliphatic and aromatic radicals containing up to about 10 carbon atoms per radical; bis(cyclopentadienyl)chromium and substituted derivatives thereof; and pi bonded zerovalent organochromium compounds. 46. A method according to claim 45 wherein said chromium compound is tetrakis-(trimethylsilylmethyl)chromium(IV). 47. A method according to claim 45 wherein a mixture of at least two of said organochromium compounds is used. 48. A method according to claim 1 comprising in addition introducing a chromium component onto said alumina to form a catalyst. 49. A method according to claim 48 comprising in addition subjecting the resulting composition to activation in an oxidizing ambient at 500°C-800°C so as to convert at least a portion of the chromium of said chromium component to the hexavalent state. 50. A method according to claim 49 comprising in addition combining said catalyst with a cocatalyst. 51. 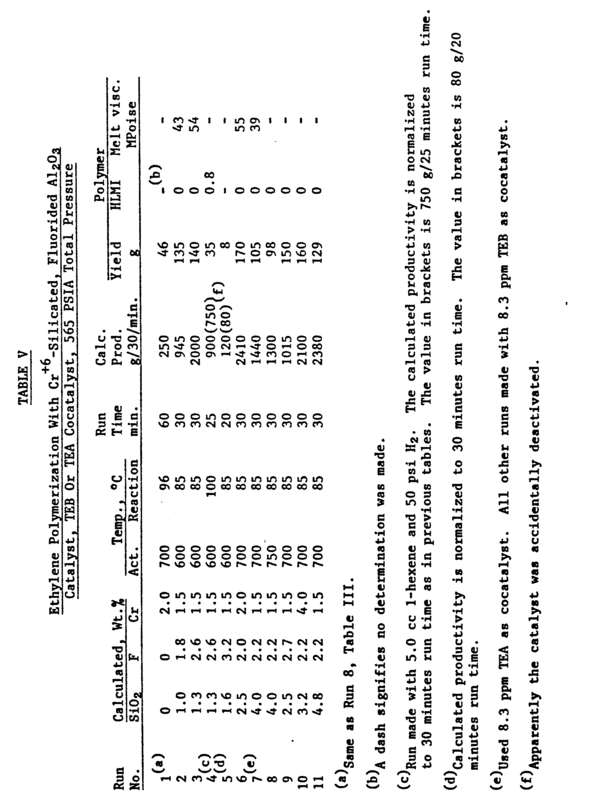 A method according to claim 49 wherein said chromium component is selected from the group consisting of chromium trioxide, chromium acetate and chromium nitrate and wherein said chromium component is included in an amount sufficient to give 0.1 to 5 weight percent chromium based on the weight of alumina and wherein said oxidizing ambient is air. 52. A method according to claim 51 comprising in addition combining said catalyst with a cocatalyst. 53. A method according to claim 52 wherein said cocatalyst is selected from organoboron compounds and organoaluminum compounds. 54. A method according to claim 53 wherein said cocatalyst is triethylborane. 55. A method according to claim 48 wherein said support is activated at a temperature within the range of 150°C-1,000°C prior to said introducing said chromium component and wherein said chromium component is an organochromium compound. pi bonded zerovalent organochromium compounds. 58. A method according to claim 57 wherein said chromium compound is tetrakis-(trimethylsilylmethyl)chromium(IV). 60. A method of producing a catalyst comprising contacting alumina with a fluoriding agent to produce a fluorided alumina, said fluorided alumina containing in addition a chromium component, said resulting composition being activated by heating in an oxygen containing ambient at a temperature within the range of 300°C-900°C so as to convert at least a portion of the chromium of said chromium component to the hexavalent state and combining the resulting hexavalent containing chromium catalyst with a cocatalyst. 61. A method according to claim 60 wherein said fluoriding agent is ammonium bifluoride. 62. A method according to claim 61 wherein said ammonium bifluoride is present in an amount sufficient to give 0.5 to 5 weight percent fluorine on said alumina based on the weight of said alumina. 63. A method according to claim 61 wherein said fluoriding agent is introduced by forming a slurry of said alumina in a solution of said fluoriding agent. 64. A method of claim 60 wherein said chromium component is selected from chromium trioxide, chromium acetate and chromium nitrate and is present in an amount sufficient to give 0.1 to 5 weight percent chromium based on the weight of said alumina. 65. A method according to claim 60 wherein said cocatalyst is selected from organoboron compounds and organoaluminum compounds. 66. A method according to claim 65 wherein said cocatalyst is triethylborane. 67. A method according to claim 66 wherein said fluoriding agent is ammonium bifluoride which is introduced by forming a slurry of said alumina in a solution of said ammonium bifluoride which solution is used in an amount sufficient to give 0.5 to 5 weight percent fluorine on said alumina based on the weight of said alumina. 68. A method according to claim 67 wherein said chromium component is selected from chromium trioxide, chromium acetate, and chromium nitrate and wherein said chromium component is used in an amount sufficient to give 0.1 to 5 weight percent chromium based on the weight of said alumina. 69. A method according to claim 60 comprising in addition subjecting said alumina to a phosphating or phosphiting treatment. 70. A method according to claim 69 wherein said alumina is calcined in air at 300°C-700°C, thereafter contacted with a methanol solution of phosphoric acid prior to contacting with said fluoriding agent. 71. A method of producing a catalyst comprising subjecting alumina to a fluoriding treatment to produce a fluorine treated alumina, said thus treated alumina being activated at a temperature within the range of 150°C to 1000°C and thereafter introducing an organochromium compound having the chromium thereof in a valence below the maximum valence of chromium. 73. A method according to claim 72 wherein said organochromium compound is selected from the group consisting of octakis-(p-trimethylsilylmethyl)tetrachromium(II), tetrakis-(trimethylsilylmethyl)chromium(IV), bis(cyclopentadienyl)chromium and dicumene chromium. 74. A method according to claim 73 wherein a mixture of at least two of said chromium compounds are introduced. 75. A method according to claim 74 wherein said mixture comprises a mixture of octakis-(p-trimethylsilylmethyl)tetrachromium(II), and bis(cyclopentadienyl)chromium. 76. A method according to claim 71 comprising in addition subjecting said alumina to a phosphating or phosphiting treatment. 77. A method according to claim 76 wherein said alumina is calcined in air at 300°C-700°C and thereafter contacted with a methanol solution of phosphoric acid prior to said fluoriding treatment. 78. A process comprising impregnating alumina with a liquid containing a source of phosphate ions and at least one aluminum salt and thereafter contacting with a neutralizing agent to form a gel of aluminum phosphate within pores of said alumina. 79. A method according to claim 78 wherein said source of phosphate ions is one of phosphoric acid, dihydrogen ammonium phosphate and hydrogen diammonium phosphate and wherein said aluminum salt is aluminum nitrate. 80. A method according to claim 79 wherein said base is selected from ammonia gas and ammonium hydroxide. 81. A method according to claim 80 wherein said source of phosphate ions is one of orthophcsphoric acid, dihydrogen ammonium orthophosphate and hydrogen diammonium orthophosphate and wherein said aluminum salt is aluminum nitrate. 82. A method according to claim 81 comprising in addition the inclusion of a chromium compound to produce a catalyst. 83. A method according to claim 82 wherein the resulting composition is activated in oxidizing ambient to a temperature within the range of 300°C-900°C. 84. A method according to claim 83 wherein said chromium component is selected from chromium trioxide, chromium nitrate and chromium acetate. 85. A method according to claim 82 wherein said chromium component is an organometal chromium component having chromium in a valence less than the maximum valence for chromium. 88. A method according to claim 87 wherein said chromium compound is tetrakis-(trimethylsilylmethyl)chromium(IV). 89. A method according to claim 87 wherein a mixture of at least two of said chromium compounds are present. 90. A method according to claim 78 wherein said alumina, prior to said impregnating, has been treated with at least one of a silicating agent or a fluoriding agent. (i) an alumina composition having an aluminum phosphate gel precipitated in the pores thereof and having a chromium compound associated therewith. 92. A method according to claim 91 wherein said alumina has been treated with ammonium bifluoride and an alcoholic solution of polymeric siloxane form of tetraethoxysilane. 93. A composition according to claim 1. 94. A composition according to claim 5. 95. A composition according to claim 9. 96. A composition according to claim 34. 97. A composition according to claim 78. 98. A catalyst composition according to claim 11. 99. 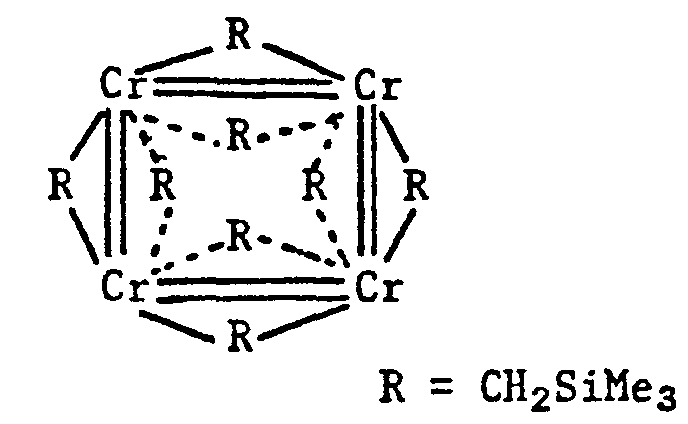 A catalyst composition according to claim 22. 100. A catalyst composition according to claim 36. 101. A catalyst composition according to claim 48. 102. A catalyst composition according to claim 60. 103. A catalyst composition according to claim 69. 104. A catalyst composition according to claim 71. 105. A catalyst composition according to claim 82. 106. A catalyst composition according to claim 91. 107. A polymerization process comprising contacting at least one mono-I-olefin under polymerization conditions with the catalyst of claim 98. 108. A polymerization process comprising contacting at least one mono-1-olefin under polymerization conditions with the catalyst of claim 99. 109. A polymerization process comprising contacting at least one mono-I-olefin under polymerization conditions with the catalyst of claim 100. 110. A polymerization process comprising contacting at least one mono-1-olefin under polymerization conditions with the catalyst of claim 101. 111. A polymerization process comprising contacting at least one mono-1-olefin under polymerization conditions with the catalyst of claim 102. 112. A polymerization process comprising contacting at least one mono-1-olefin under polymerization conditions with the catalyst of claim 103. 113. A polymerization process comprising contacting at least one mono-1-olefin under polymerization conditions with the catalyst of claim 104. 114. A polymerization process comprising contacting at least one mono-1-olefin under polymerization conditions with the catalyst of claim 105. 115. A polymerization process comprising contacting at least one mono-1-olefin under polymerization conditions with the catalyst of claim 106. 116. An ethylene polymer having a melt viscosity of 35 MPoise or greater and a density of 0.94 g/cc or greater. 117. An ethylene polymer having an intrinsic viscosity of greater than 13 dL/g and a density of greater than 0.94. 1. A method of producing a surface silicated alumina composition characterized by contacting said alumina with a silicating agent in solution or in vaporous form and thereafter converting said silicating agent to silica on the surface of said alumina. 2. The method of claim 1 characterized in that said silicating agent is a polymeric siloxane and said polymeric siloxane after said treating is converted to silica on the surface of said alumina by calcining in air at a temperature within the range of 500 to 800°C; in particular wherein said silicating agent is used in an amount sufficient to give 0.5 to 10 weight percent silica based on the weight of the alumina; in particular wherein said contacting with said silicating agent is carried out in a slurry of said alumina in said solution of said silicating agent in a 1 to 6 carbon atom alcohol. 3. The method of claim 1 or 2 characterized by additionally subjecting said alumina to treatment with a fluoriding agent. 4. A method of producing a catalyst characterized by contacting alumina with a fluoriding agent to produce a fluorided alumina, said fluorided alumina containing in addition a chromium component, the resulting composition being activated by heating in an oxygen-containing ambient at a temperature within the range of 300-900°C so as to convert at least a portion of the chromium of said chromium component to the hexavalent state and combining the resulting hexavalent chromium-containing catalyst with a cocatalyst. 5. A method of producing a catalyst characterized by subjecting alumina to a fluoriding treatment to produce a fluorine treated alumina, said thus treated alumina being activated at a temperature within the range of 150 to 1000°C and thereafter introducing an organochromium compound having the chromium thereof in a valence below the maximum valence of chromium. 6. A method of producing a modified alumina characterized by impregnating alumina with a liquid containing a source of phosphate ions and at least one aluminum salt and thereafter contacting with a neutralizing agent to form a gel of aluminum phosphate within pores of said alumina. 7. The method of claim 6 characterized in that said source of phosphate ions is one of phosphoric acid, dihydrogen ammonium phosphate and hydrogen diammonium phosphate and said aluminum salt is aluminum nitrate; in particular wherein said source of phosphate ions is one of orthophosphoric acid, dihydrogen ammonium orthophosphate and hydrogen diammonium orthophosphate and said aluminum salt is aluminum nitrate; in particular wherein said neutralizing agent is selected from ammonia gas and ammonium hydroxide. 8. The method of claim 6 or 7 characterized in that said alumina, prior to said impregnating, has been treated by additionally introducing a chromium component onto or with said alumina to form a catalyst. 13. The method of claim 12 characterized by additionally subjecting the resulting composition to activation in an oxidizing ambient at 500-800°C so as to convert at least a portion of the chromium of said chromium component to the hexavalent state. 14. The method of claim 12 or 13 characterized by additionally combining said catalyst with a cocatalyst; in particular wherein said cocatalyst is selected from organoboron compounds and organoaluminum compounds; in particular wherein said cocatalyst is triethylborane. 15. The method of claim 13 or 14 characterized in that said chromium component is selected from chromium trioxide, chromium acetate and chromium nitrate; in particular wherein said chromium component is included in an amount sufficient to give 0.1 to 5 weight percent chromium based on the weight of alumina; in particular wherein said oxidizing ambient is air. 16. The method according to claim 12 characterized in that said chromium component is an organometal chromium component having chromium in a valence less than the maximum valence for chromium; in particular wherein said chromium component is an organochromium compound and said alumina is activated at a temperature within the range of 150 to 1000°C prior to introducing said chromium component. wherein n is 3 or 4; x is 3 or more; R is -CH2MR'R"R"'; wherein M is C, Si, Ge, Sn or Pb; and wherein in a given compound the R groups are identical and R', R", and R"' are the same or different hydrocarbyl groups selected from aliphatic and aromatic radicals containing up to 10 carbon atoms per radical; bis(cyclopentadienyl) chromium and substituted derivatives thereof; and pi bonded zerovalent organochromium compounds. 18. The method of claim 17 characterized in that said chromium compound is selected from octakis-(µ-trimethylsilylmethyl)tetrachromium(II), tetrakis-(trimethylsilylmethyl)chromium(IV), and bis(cyclopentadienyl)chromium and dicumene chromium; in particular wherein said chromium compound is tetrakis-(trimethylsilylmethyl)chromium(IV); in particular wherein said chromium compound is octakis-(u-trimethylsilyl methyl)tetrachromium(II); in particular wherein a mixture of at least two of said organochromium compounds is used; in particular wherein said mixture comprises a mixture of octakis-(u-trimethylsilylmethyl)tetrachromium(II), and bis(cyclopentadienyl)chromium. 20. A catalyst composition as obtained in any of claims 12 to 18. 21. The use of the catalyst of claim 20 for the polymerization of at least one mono-1-olefin to obtain olefin polymers; in particular wherein said olefin polymer is an ethylene polymer having a melt viscosity of 35 MPoise or greater and a density of 0.94 g/ml or greater; in particular wherein said olefin polymer is an ethylene polymer having an intrinsic viscosity of greater than 13 dl/g and a density of greater than 0.94.g/ml.